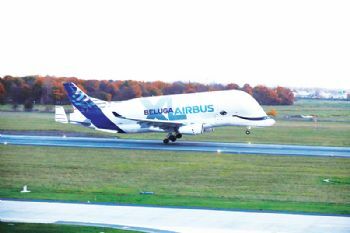 The much-anticipated UK debut of Airbus’s (www.airbus.com) BelugaXL super-transporter aircraft took place last week at Hawarden Airport in Broughton (North Wales). This distinctive aircraft — the first of five that will eventually replace the current fleet of standard (ST) Beluga transporters — made its maiden test flight from Toulouse last July, but this was its first visit to the UK (as part of its 12-month testing programme). Like its predecessor, it will transport aircraft parts — including wings made in Broughton — to various Airbus sites in Europea and is due to enter service later this year. It has a wingspan of 60m — 35% bigger than the wings of the Beluga ST — along with increased capacity and take-off weight, so Hawarden Airfield had to be upgraded to a ‘Code E’ aerodrome, with the runway resurfaced and a new ‘turn pad’ constructed at each end. The BelugaXL is fitted with two Rolls Royce Trent 700 engines, which will provide about 30% more thrust than the General Electric engines fitted to the current Beluga fleet. It will be able to transport two A350 XWB wings to the final assembly line in Toulouse, whereas the ST can only carry one. After replacing the Beluga A300-600 aircraft that have been in service since 1995, each of the BelugaXLs will perform between 900 and 1,000 flights per year, logging around 1,700 to 1,800hr annually in servicing 11 locations across the company’s European industrial network.